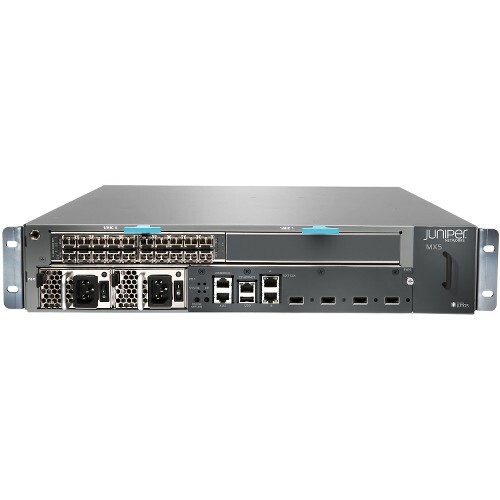 Juniper Networks MX5, MX10, MX40 and MX80 3D Universal Edge Routers for the midrange deliver high performance and easy upgradability with a scalable architecture. Each of the MX Series midrange routers can be upgraded using a software license in a “pay-as-you-grow” model, and are the most compact members of the MX Series product family. Two rack units (2 RU) high and built to support optional redundant power supplies and fans, these platforms are perfectly suited for smaller scale environments requiring full Ethernet capabilities and the advanced services and features of the MX Series routers.